HomePoliticsDemocrats Pledged to Lower Health Costs. They Just Haven’t Figured Out How. March 18, 2019 Politics Comments Off on Democrats Pledged to Lower Health Costs. They Just Haven’t Figured Out How. Many Democrats focused their election campaigns around protecting people with pre-existing conditions, and they want to move quickly to votes on proposals to do that — in part to test Republicans who made similar pledges during their campaigns. But more than two months after taking power, the full House has yet to vote on the issue. Instead, the three House committees with jurisdiction over health care — Energy and Commerce; Ways and Means; and Oversight and Reform — have channeled their energies into numerous hearings on how to lower prescription drug costs, how to expand coverage and protect people with pre-existing conditions and how to override actions by the Trump administration. Legislation is coming. Democrats are considering restricting the sales of short-term insurance policies, approved by the Trump administration, that do not have to comply with the Affordable Care Act, which means they do not have to provide essential health benefits and can discriminate against those with pre-existing conditions. Democrats are also looking for ways to cooperate with Republicans on proposals to lower the cost of prescription drug prices and to outlaw tactics used by brand-name companies to delay competition from generics. 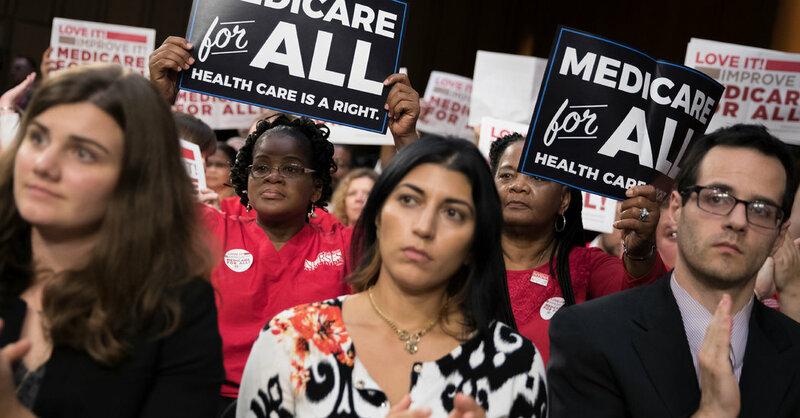 Hearings on Medicare for all — which begin as early as April, according to Representative Pramila Jayapal, Democrat of Washington, who is leading the push for the Medicare for All Act — will come against those proposals.